So if you’ve been with us since the beginning (or if you’ve dug through our archives), you might remember our Candied Apple Walnut Salad, the one that promises to make a blue cheese lover out of even the greatest skeptic. This salad is very similar, only a little more fall-y. So even though we’ve only recently hit slightly cooler temperatures (and only then because we’ve been hammered by Tropical Storm Lee), I’m totally in fall mode and pears just speak to me in a very fall-ish way. Not literally–that would be weird. This is a great little side salad that is a great transition from summer into cooler temperatures–you could serve it at, say, a Labor Day potluck with grilled goodies or you could serve it alongside your favorite roast beef or pork. You could also add strips of grilled chicken to make and serve larger portions as a dinner salad. For the dressing, you’ll need red wine vinegar, 1/4 c. minced onion, sugar, coarse-grained mustard (in true Kate fashion, I used Creole mustard), 2 cloves garlic, 1/2 tsp. kosher salt, olive oil, and freshly ground black pepper to taste. You’ll also need your imaginations because I forgot to take pictures of the dressing. Can we still be friends? Combine the vinegar, minced onion, sugar, mustard, garlic, and salt in the jar of your blender and blend until smooth. With the blender running, add the olive oil in a steady stream until combined. Season with black pepper to taste and refrigerate. For the salad, you’ll need a head of Romaine lettuce, 3 pears, 4-5 ounces of crumbled Roquefort or Gorgonzola cheese, 1 avocado peeled, pitted, and diced, white sugar, and chopped pecans. Spray a sheet of foil or parchment with non-stick cooking spray and set aside. In a small, nonstick skillet (if possible), combine the sugar and chopped nuts. Heat over medium, stirring constantly, until the sugar melts and coats the nuts evenly in syrup. 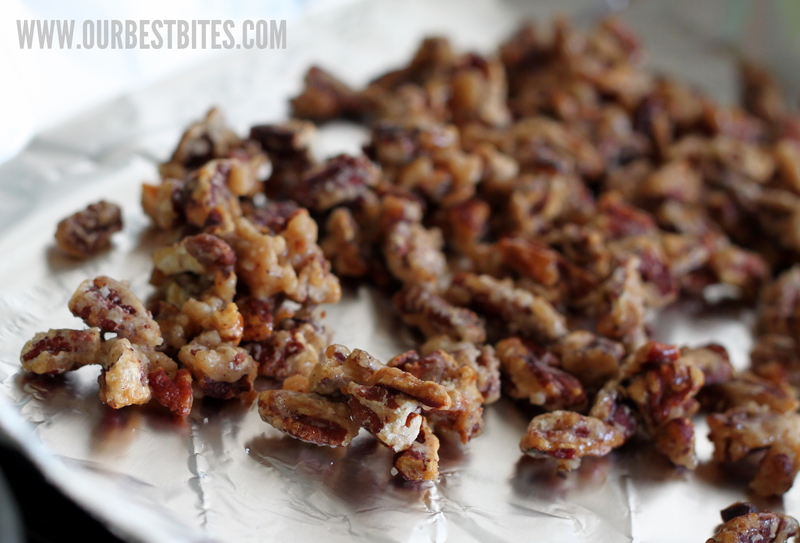 Spread the candied nuts onto the prepared sheet of foil/parchment and allow to cool completely. and place it in a large salad bowl. Seed and dice the pears and toss them with the diced avocados with the lettuce. 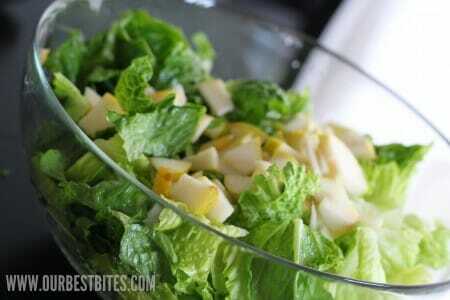 and drizzle it with the dressing. This will serve about 4-6 as a main dish and 8-10 as a side dish. Combine all ingredients except for the olive oil in the jar of your blender and blend until smooth. Add the olive oil in a a steady stream until completely blended. 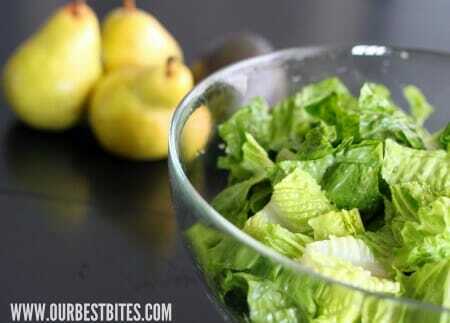 Add black pepper to taste and refrigerate until you’re ready to drizzle onto the salad. Spray a sheet of aluminum foil or parchment with non-stick cooking spray and set aside. In a small non-stick skillet (if possible), stir the nuts and sugar constantly over medium heat until the sugar melts and the nuts are evenly coated in the sugar syrup. Spread the nuts over the prepared sheet of foil or parchment and let them cool completely. 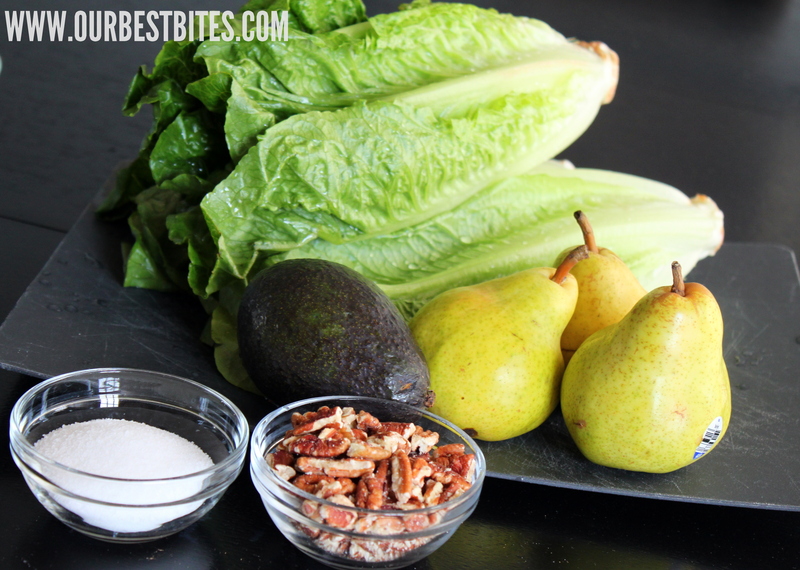 While the nuts are cooling, toss together the chopped lettuce and diced pears and avocado. 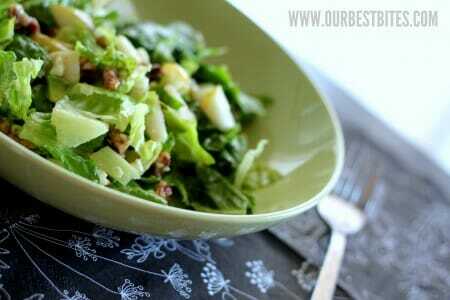 Add the crumbled cheese and candied nuts, then drizzle the dressing over the salad and toss gently to combine. If serving as a meal, you can add grilled chicken. Makes 4-6 main dish servings or 8-10 side dish servings. oh yum!!!! i have a bag full of pecans i brought home from california that i was just contemplating last night and we love adore worship avocados and gorgonzola! i’m going to make it tonight! thanks! This salad sounds lovely! Yum! 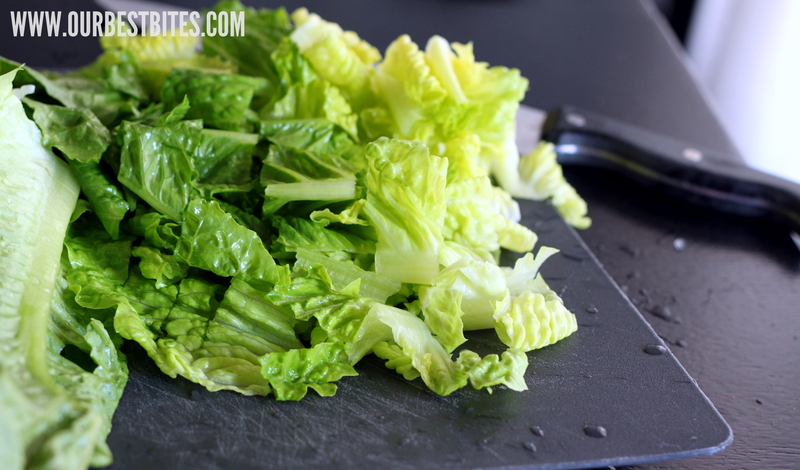 This does look like a perfect transition salad! Sounds wonderful! Looks wonderful! Not a fan of any sort of blue cheese. Suggestions for a substitute? 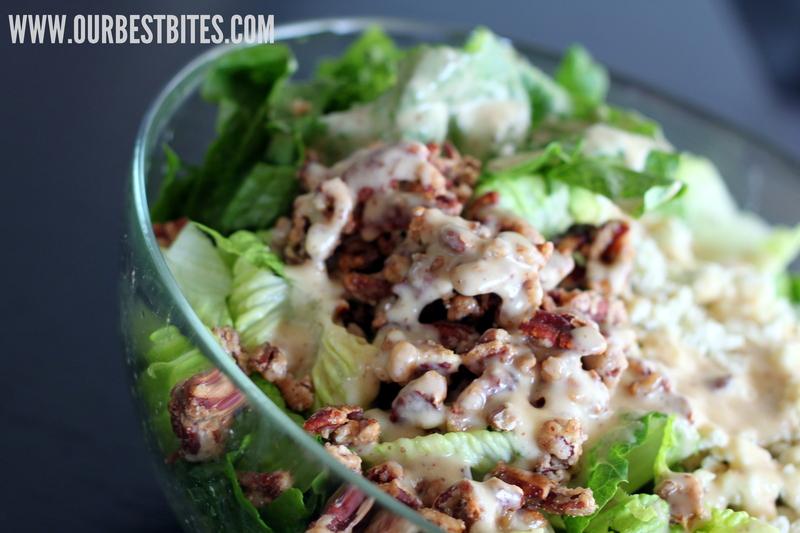 I’ve always used goat cheese in the apple pecan salad and it worked really well, I bet it would be good in this one too. This definitely speaks fall to me. I’m a lover of blue cheese, so I’d definitely go back for seconds!! Sounds great! 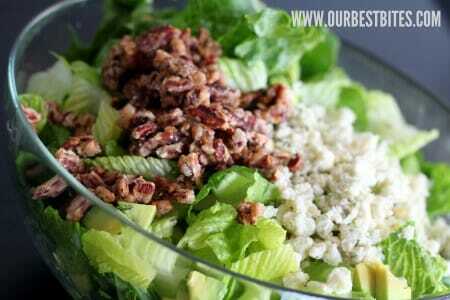 I always love me a good salad, and this looks divine! Do you have any additional suggestions for candying the pecans? I have other salad recipes that call for this, and mine just never turn out right. They’re either burned, or the sugar is still crystalized. Jessica, my initial guess is that the temperature might be a little too high. Even though it might take longer, you might want to turn it down to medium-low and see if that helps. Sounds yummy. I had one similar to this at a local sandwich shop, but it also included bacon. Super yummy. My husband LOVES blue cheese. I’m definitely going to make this salad. Great post! Yes, we can still be friends. Just thought I’d let you know, to ease your mind. Wouldn’t want you worrying about it all day. This combo sounds delicious! Will definitely be adding it to my “must-make” list! Hi! I’ve loved your site for a long time and I while I was living at home I loved being able to make all of your fun recipes and being able to have something a little different for dinner. The only problem is that I just moved away to college (at BYU no less!!!! :)) and I no longer have my mother’s wonderfully stalked kitchen or her ability to get some expensive ingredients. So my question is this, could you direct me to some great recipes that only require a few ingredients? I’ve got the basics, flour, sugar, milk, a few spices, etc, but that’s pretty much it. I’m just struggling to find a recipe that doesn’t make me buy a grocery kart full of new ingredients that I may never use again. ALSO do you recommend I get anything else for my primitive kitchen? I saw your list of things to stock a kitchen with, but I don’t feel like i’m to that level yet 🙂 Thank you so much! I love reading your blog and look forward to new entries all the time! Yum! My mother-in-law makes this exact salad but for the cheese she buys that bleu cheese that is rolled in dried cranberries at Costco. Divine! Is it OK if I throw in some Craisins or similar, or is that totally not-done? Did not see #13 comment. Clearly, Emily’s MIL and I are on the same page o’ the cookbook. Oh my gooness YUM. So glad I found your site. I was in Costco the other day and came across your book. I was like a Mormon Mom’s Cookbook in Costco… in Los Angeles!! I bought it.. and found you on the internet. Congrats on your success. And I took advantage to give you a nice loud shout-out! One of my favorite restaurants makes a similar salad and I LOVE it. COuple that with me being a Our Best Bites fanatic, I couldn’t wait to try this. Waaaaaaaaaaaaaay too much onion! Maybe I had super-strength onion??? It was overwhelmed my palate completely and it was all I could taste. I am going to make the dressing again with MUCH less onion. I think it would be really good with that change. Also I did the calorie count on this salad and it came in at 2,000 for the whole recipe. I used a little less of the high fat ingredients and easily shaved off a lot fat and calories without sacrificing flavor. Reduced-fat blue cheese is amazing! I would never know it was reduced fat! I would have to agree, the dressing was so pungent, as to be overwhelming. To fix it I had to sprinkle additional sugar over the salad, after I had already tossed it with dressing, to make it palatable. Maybe a sweet onion would be better. The whole family loved it though, but that dressing stays with you the rest of the day. So my Mom and I made this for lunch today… thank you very much! This salad is the bomb.com! We added dried tart cherries to it too. (amazing!) A new fave for sure!! Freaking heaven on a plate! I just got done eating this and it was amazing! Oh, I loved this and shockingly had all the ingredients on hand. Always awesome. I substituted onion powder for the onion in the dressing because all I had on hand were yellow onions which I thought would be waaaay too powerful for pears and candied pecans. Still a delicious salad.